The game that is very simple at scoring is standard lawn darts. Each player starts with 2 darts and teams alternate each throw aiming at a circular target 35 feet away from them. The only points that count in this game are ringers or ones that land on the inside of the circle target. Points can offset or cancel each other out in this game, so if each team scores 1 dart in the center and 1 on the outside there are no points awarded for this round. Each dart that is scored in the circle without your opponent having one to cancel it out is worth 3 points. This makes defense and strategy key components to the game to hit when your opponent does. 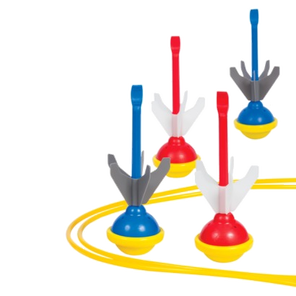 There is also a variation of this game in some sets that come with a smaller ring that can serve as a bulls eye to score additional points.